There’s a new game out with direct connections to Undertale. You know what that means: it’s time for the whole internet to turn into that one meme of Charlie Day. Yesterday, Undertale creator Toby Fox surprise-released a new game called Deltarune. The free RPG is the first chapter of a new story seemingly set in Undertale’s universe, but this time (or place???) around, nothing’s quite the same. Already, fans have theories about why that is and how it fits into unsolved Undertale mysteries like the true identity of everybody’s favorite space-time-defying spooky skeleton man W.D. Gaster. 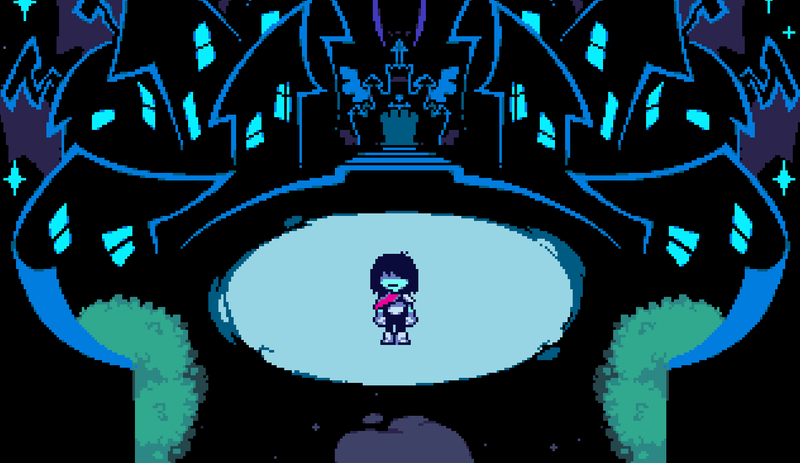 Deltarune begins with you stepping into the shoes of a human child named Kris. You’re immediately greeted by Toriel, who you might remember as the character who guided you through the tutorial in Undertale—and who ultimately became a pivotal figure in the game’s story. She drives you to school in a town that seems to be bright, full of cheery monsters, and crucially, not underground. However, after arriving late to class, you’re paired with a delinquent student named Susie to go fetch some chalk for the teacher, and the two of you fall into a separate world entirely after taking a tumble in the supply closet. Thus begins a journey in which a prince tells you you’re part of a trio of legendary heroes who are destined to restore balance between dark and light. You fight—or spare—monsters in a very Undertale-esque fashion, all while meeting and in some cases defeating a cast of increasingly wacky new and old characters. Now, this is just the first chapter of an episodic game, so it’s tough to be certain about anything at this point. Even people’s understanding of Deltarune’s setting is hazy at best. Given how happy and not-underground everything is, you might be tempted to believe Deltarune is set after Undertale’s pacifist ending, but fans speculate that that’s some classic Toby Fox misdirection. For one, nearly every Undertale character who appears in Deltarune behaves pretty differently, with some who used to be close seeming to despise each other or to have never met. It’s also full of characters who parallel Undertale’s main cast, all the way down to their names. Kris is similar to Frisk, Ralsei is like Asriel, etc. Also, Deltarune is an anagram of Undertale. The theory that’s gained the most traction so far is that Deltarune takes place in an alternate timeline before all of Undertale’s space-time-warping save/reload trickery. People who buy into this theory point to some key clues buried in Undertale—specifically, allusions that pun-obsessed skeleton man and hero to lazy cosplayers everywhere Sans had a timeline he wished to go back to and, more concretely, a picture in his secret room that featured three mysterious figures and the words “don’t forget.” Fans now believe those three figures are the three heroes of Deltarune and that its comparatively idyllic setting was his destination. This is further backed up by the fact that Sans exists in Deltarune, but doesn’t seem to know anybody (whereas in Undertale, he knew pretty much everybody because he’d seen a whole, whole lot by that point). However, there are also theories that Deltarune takes place after Undertale’s genocide run, or in an entirely separate parallel universe. Top Undertale scholars are still debating. Then there’s the somehow even more meta elements of all this, which are as confusing as ever. At the start of the game, you create a “vessel” for your heart that’s then discarded in favor of Kris, because “no one can choose who they are in this world.” However, the first time you save, there’s already a save file for Kris, which you overwrite with a file bearing your own name. Have you taken over Kris’ life—in effect destroying them—or are you just guiding them on their journey like you did with the protagonist in Undertale? And who are you, even? You’re not Kris, but you’re controlling Kris. Are you Kris’ soul? Are you an entity that exists outside the game even as you control it, making you functionally the same character you were in Undertale? If the latter, does that open the door to the existence of Chara—a demented, once-human entity who came to the forefront in Undertale’s genocide run and shared the same soul as the protagonist—in this universe as well? And what does it mean when, at the end of Deltarune’s first chapter, Kris tears out their heart—which seems to be used to represent you, the player, and your soul? Are they rejecting you, or something (or someone) else? I know: my head hurts too. Then there’s the question of whether or not your approach to the kill/spare dichotomy even matters this time around. Because the central message of Deltarune’s first chapter seems to be that your choices don’t matter. You’re told this both when you try to create a character at the start and later by party member Susie, who flat out says, “If you haven’t gotten it by now, none of your choices matter.” Given that Undertale became an entirely different game based on your moment-to-moment choices, it wouldn’t be surprising to see Toby Fox subvert that. Genre subversion is kind of his thing, and how better to epitomize that than by subverting his own previous game? Lastly, there’s Gaster. Deltarune does acknowledge him, albeit only in one slim way so far. If you try to name your character “Gaster” at the beginning, the game immediately restarts, mirroring what happened if you did the same thing in Undertale. Some believe that Gaster was responsible for the destruction of the original timeline Sans so desperately wished to return to in Undertale, so future Deltarune chapters could potentially give us a glimpse at how all of that played out. But while there are already theories that Gaster is behind everything that’s taking place in Undertale and Deltarune, dataminers—who were largely responsible for discovering Gaster last time around—have found strikingly little sign of him in this chapter’s code. The code does contain some other interesting nuggets, though. Dataminers claim that the game checks your computer clock’s date and time upon opening, for instance. It also apparently checks to see if you have an Undertale save file that ever included a Genocide run. If you did decide to commit that heinous act, well, good luck. If Deltarune is anything like Undertale, don’t expect it to let you live it down.